Continuing interest and debate about FAIR and Open Data has triggered rather extensive international efforts to develop recommendations and services that may be helpful to have greater exploratory research, constructive discussions and solutions based on interoperable data. Constant interplay with the data and deep involvement with the research context are pivotal elements to achieve success in both an inductive analysis and deductive re‐analysis. Fairness-aware data must fulfil the FAIR principles that include qualified references to the dependable indicators of Findability, Accessibility, Interoperability, and Reuse of digital assets. This means, that communities of practice have to not only understand what is meant by FAIR data, but also be able to monitor the FAIRness of their digital assets in a quantitative manner (FAIR Metrics : Framework to understand how increasing the FAIRness is; FAIR self-assessment tool). common (metadata) standards, schemes and vocabularies for encoding digital assets (more about in FAO LODE-BD recommendations) to achieve common interpretations (semantic interoperability) of data and services. According to the recent work FAIRsharing, a cohesive community approach to the growth in standards, repositories and policies published by the FAIRsharing team on BioRxiv, “Thousands of community-developed standards are available (across all disciplines), many of which have been created and/or implemented by several thousand data repositories”… “but, do we use them?” (FAIRsharing: working with and for the community to describe and link data standards, repositories and policies). To help bridge the gap between fragmentation and integration of semantic resources, understood here as Knowledge Organisation Systems (KOSs) or value vocabularies [including controlled vocabularies, value lists, subject headings, classification systems, glossaries, thesauri and lightweight ontologies] in (research, business) practices, different communities continue working on the enhancement and promotion of semantic products/services to the international community. 2. GODAN Action project has been curating VEST/AgroPortal online map or Agrisemantics Map of (~400) Data Standards that also includes KOSs indexed in AgroPortal: an ontology portal/repository dedicated to the agronomic and plant domains. Have you already used this Map of Standards? You are cordially invited to help us improve this map – please complete our 2min survey here; thank you! 3. Wheat Data Interoperability, Rice Data Interoperability, On-Farm Data Sharing, AgriSemantics Working Groups (WGs) of the Interest Group on Agricultural Data (IGAD) of the Research Data Alliance (RDA) develop and provide the strategic direction for the adoption of their recommendations (based on set of use cases and requirements) on support of appropriate use of semantics (or the description of the meaning of data) needed for data interoperability, with special focus on agriculture. You are invited to learn more about some outputs from the RDA IGAD Wheat Data Interoperability and AgriSemantics WGs that have been recently adopted by INRA (French National Institute for Agricultural Research) for different aspects of its Open Science policy. 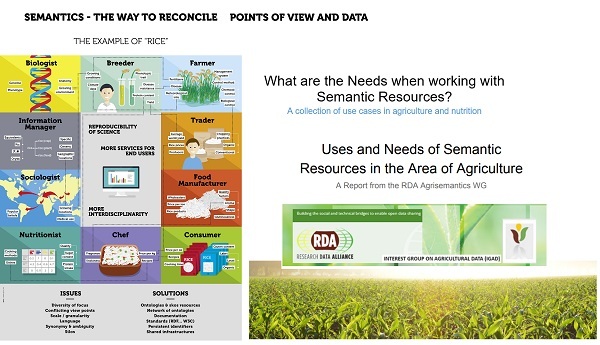 This document presents the AgriSemantics WG efforts towards the definition of recommendations exposing the use of semantic resources to enhance future agri-food e-infrastructures. from a number of agriculture practitioners. This input was broken down into requirements that were then transformed into a set of recommendations targeting a number of profiles, including policy makers, funders, software developers, research scientists and data managers. This report also highlights several AGROVOC multilingual thesaurus use-cases on support of data integration and interoperability in different communities of practice working with agriculture and nutrition data. “The under-representation of recommended terminology artifacts and models/formats is of particular concern…When a standard is mature and appropriate standard-compliant systems become available, such as databases and repositories, these must then be channelled to the relevant stakeholder community, who in turn must recommend them (e.g. in data policies) or use them (e.g. to define a data management plan) to facilitate a high-quality research cycle” (FAIRsharing: working with and for the community to describe and link data standards, repositories and policies, by Sansone et al., in BioRxiv, Preprint, 2018). This will contribute to the improvement in interoperability that will enable greater data discoverability across repositories. Make your research data FAIR (Findable, Accessible, Interoperable and Re-usable) just doing it in a FAIRifying challenge! Recently, the Scientific Symposium on FAIR Data Science for Green Life Sciences (which was held on 12 December 2018 in WUR: Wageningen Data Competence Center), Linked Data specialists, ontologists and domain experts from WUR, GO FAIR, Micelio, DTL:Dutch Techcentre for Life Sciences & GODAN: Global Open Data for Agriculture and Nutrition in collaboration with food safety research institute RIKILT demonstrated how research data can be made FAIR. Participants shared their struggles, gains, lessons learned (see, e.g., A Research Data Policy at Wageningen University & Research: Best Practices as a Framework) and opportunities to achieve machine-readable FAIRdata. With the theme, 'With Data Comes Responsibility', RDA P13 will explore how the international, inter- and trans-disciplinary nature of RDA has helped to lay a foundation for global partnerships and addressing responsibility throughout the data-lifecycle and across all domains. ... AGRICULTURE DATA INTEREST GROUP (IGAD)... IN PHILADELPHIA! please send an e-mail to AIMS@FAO.ORG (Subject: IGAD RDA pre-meeting 2019/1) with the title and brief abstract of your contribution before 22 February 2019. >> You may also be interested in taking a look at outcomes from the IGAD RDA's 12th and IGAD RDA's 11th pre-meetings that were held in Botswana/Gaborone (November 2018) and in Germany/Berlin (March 2018). Once again, thanks for Your dedication, interest, commitment and desire to contribute and promote different aspects of interoperability in the agri-food sector & beyond! Our common goal should be harmonization and mapping among different data standards to allow interoperability and convergence in common use!